First time visitors to London often struggle to identify the best areas for their stay here. Below is a detailed guide to London Bridge and its immediate surrounding area. Whether you are a student, professional or visiting tourist, read on to find out more about the area (including the types of homes available, safety and transport links). Where is London Bridge located? Named after the bridge crossing the Thames to the north of it, London Bridge sits on the south bank of the River Thames (you’ll likely hear of it referred to as part of the wider ‘Southbank’ area) and is a bustling central area encompassing some major tourist attractions and administrative centres. Even if you don’t choose to stay in London Bridge, it’s possible you’ll spend time here – either studying, visiting, or exploring your surroundings in the capital. 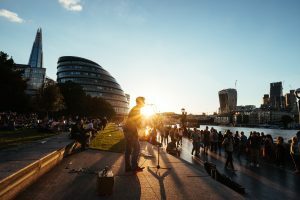 If you would like a central location for your London homestay however, this could very well be it: read on to learn more! Just south of the bridge itself, London Bridge sits directly on the southern bank of the River Thames and includes Southwark, London South Bank University and Newington. The City of London sits directly north of the river, with Lambeth to the west, Bermondsey to the east, and Walworth to the south. Taking the Thames as its northern border, Tower Bridge Road borders it to the east, and the A201 to the south and west. The postcode is SE1. What’s the typical accommodation type in London Bridge? London Bridge is a very built-up area and so not the place for detached houses or garden flats. Instead, you’ll find a range of executive riverside apartments (many new builds and with views over the Thames… for a premium), townhouses and flats above commercial properties and modern warehouse conversions. The typical London Victorian houses can be found in here, but in lesser quantities than areas further out of central. How safe is London Bridge? Its central location means that London Bridge is usually very populated and as safe as you’d expect from a capital city. Lone travellers shouldn’t experience any issues in this neighbourhood but you may find the southern ‘non-touristy’ areas quieter at night than other parts, so if you feel uncomfortable with this, taking a taxi or staying with other people may help ease any worries. What type of people live in London Bridge? Mainly, those who want to escape a hefty commute! Being so central, the residents of London Bridge tend to be fairly affluent professionals, particularly those with demanding jobs or who need to work long hours. There’s a big LGBTQ+ community in the area as well as lots of overseas visitors. What transport links does London Bridge offer? The area is better linked than ever before to the rest of the capital thanks to the opening of The Shard and its associated businesses. Overground rail runs to London Bridge and connects the area with Gatwick and Luton airports. Four tube stations within the neighbourhood; London Bridge, Southwark, Borough and Elephant & Castle; comprising the Northern, Jubilee and Bakerloo lines (with London Bridge and Southwark both also being wheelchair accessible). River services are available from London Bridge City Pier and numerous Transport for London buses run through the area. You’ll also find a plethora of Santander Cycles docking stations and private transport options such as taxis and Ubers available. The proximity of London Bridge to the rest of central London really makes it easy accessible from anywhere in the capital. What is there to do in London Bridge? You don’t have to venture far to find things to do, so if you do stay here you’ll find a whole host of amenities right on your doorstep. 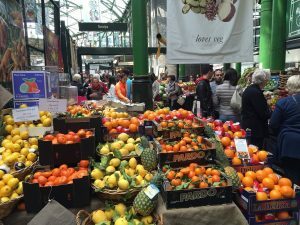 Borough Market is the UK’s oldest food market and the perfect place for a veritable feast of British produce from all over the country. Open from Thursday through to Saturday, you’ll struggle to find a grocery or ingredient you can’t locate here – there’s everything from artisan cheeses to cupcakes and fresh fruit and veg to meat and fish. A central tourist-y area, London Bridge plays home to lots of attractions that aren’t just bog-standard museum fare. The Old Operating Theatre, Museum and Herb Garrett showcases some terrifying medical moments of yesteryear in a Victorian-style operating theatre (we don’t know about you, but we won’t be volunteering for that demonstration any time soon!) and the Bridge Experience uses actors to tell the stories of ghosts, ghouls and a whole manner of other scary characters who are said to have terrorised the area over the years. Europe’s tallest building, The Shard, plays host to offices, hotels and restaurants but also an impressive viewing platform 800ft above ground-level, handily known as ‘The View from The Shard’. Tickets can be booked for day or night and on a clear day you can see up to 40 miles around – making not just for some great photos but also some breath-taking and interesting landscape views!